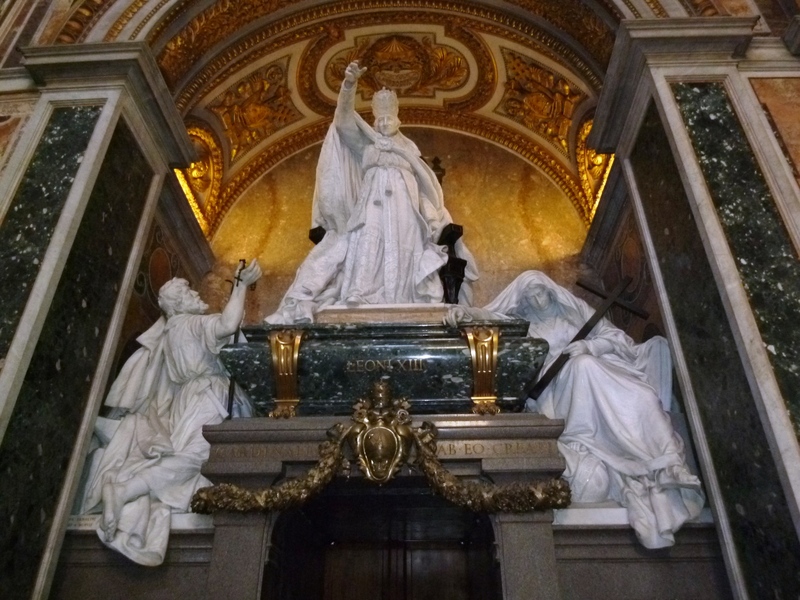 One of my favorite statues in Rome is at the Basilica of St. John Lateran. 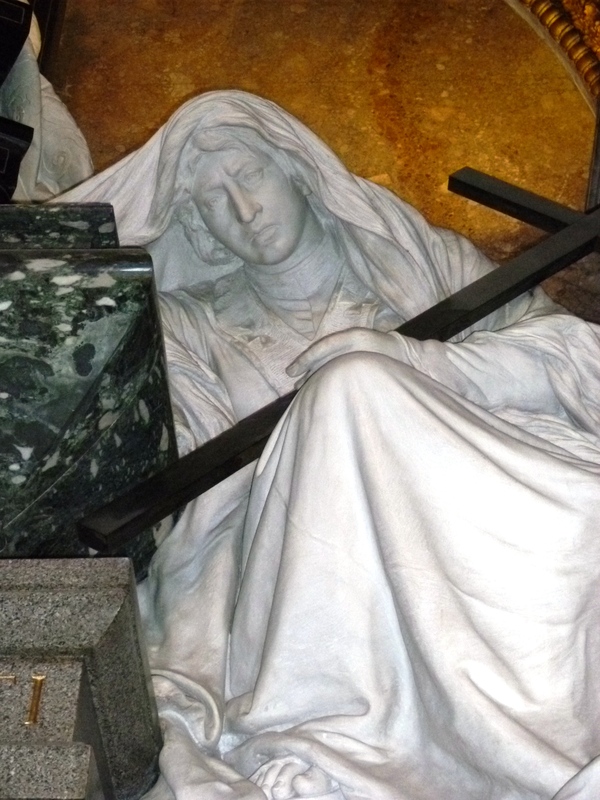 It decorates the tomb of Pope Leo XIII. The first impression you get from most statues in the grand churches of Rome is their enormity. These are no life size replicas. These are massive, over-powering pieces of art meant to inspire awe. Awe, or perhaps a feeling of one`s own diminished worth in the presence of such grandeur. The center aisle of the Lateran is flanked on both sides with gigantic representations of the 12 apostles, large enough to leave no doubt about the lads` historical and institutional importance. As a woman, it can be a tad disconcerting to be surrounded by so much marble-hewed masculine authority. And that`s why I love the statue that flanks the papal tomb of Leo XIII. The tomb soars above you. Leo, ensconced on his papal throne, towers above the man and woman at his feet; his hand lifted in blessing. The man kneels in humble reverence, hands reaching upwards in prayer. The woman…now there`s another story! This woman is completely knackered! She leans heavily against the tomb, bent over by the weight of the cross she is carrying. She appears oblivious to the gestures of blessing and homage taking place beside her. Or, maybe, she`s not so oblivious. I chuckled the first time I saw this statue, imagining the woman letting out a sigh of `oy vey`! After the chuckle, I pondered. The beauty of art is in its power to speak a unique story to each viewer. This is my story.